I have an older Mac Pro running OS X Mavericks. When I launch the Maps app the Location icon is grayed out so I can’t ask Maps to pinpoint my location. How can I get this to work? I’m afraid you can’t with your Mac's current hardware configuration. Early Mac Pros shipped without an AirPort card (you could add one as a build-to-order option) and Maps depends on a Wi-Fi connection to tell it where it is. You could always add a Wi-Fi connection by either ordering and installing the original AirPort Extreme Card or you could purchase a USB Wi-Fi adapter. With one of these on board your Mac Pro will use Wi-Fi triangulation to approximate its location and pass that information along to Maps. 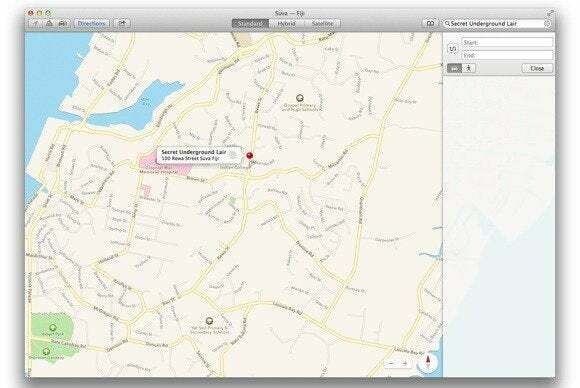 Create a contact for your Mac's location to make it easier to find with Maps. Open the Contacts app and create a new contact. In the Company field enter an appropriate name for where your Mac resides—Home, Work, or Secret Underground Lair, for example—and then enter the street address for that location. Save the contact. When working on that Mac and wishing to use your current location within Maps, just type the name of the contact you just created into Maps’ Search or Start fields. When you do, the location will appear under the Contacts list in the resulting results list. 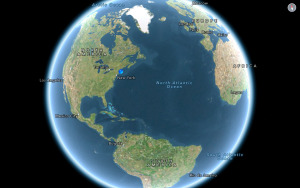 Select that location and watch as a red pin drops to denote where you are.